For a long time, the mezzanine in the Hall Building served as a student space. In 2006, this all changed when the university administration decided to build a student lounge there despite the CSU’s disapproval. The Link covered the controversy. The Concordia administration is planning on turning the second floor mezzanine into a lounge by the beginning of September—effectively displacing all events and activities from the most widely circulated area of the Hall Building. Concordia Student Union executives say they were never informed or consulted about any of the proposed changes. They received the news from Dean of Students Keith Pruden 6 p.m. last Tuesday, two days before the administration planned on moving in. “If they had consulted with us, we would have told them that we’re completely opposed to the idea,” said Justin Levy, VP external affairs of the CSU. By 7 p.m. Tuesday, representative from the Canadian Federation of Students-Quebec and former CSU execs met in he seventh floor offices and poured over documents and policy on ways to keep their claim on the mezz. 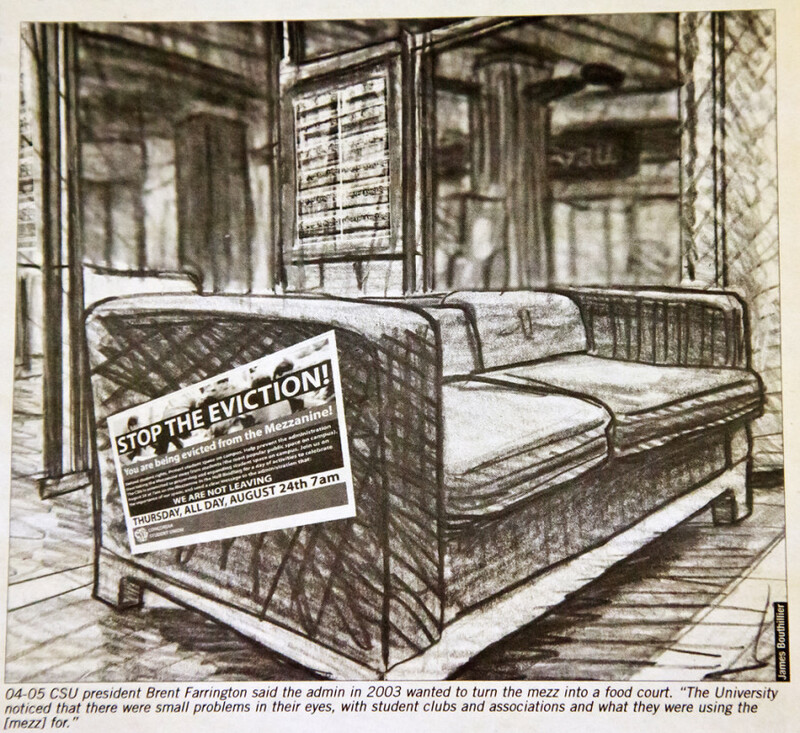 By Wednesday morning, posters were up all over the Hall Building asking students to occupy and fight “the eviction” all-day Thursday on the mezzanine. In response, the school decided they would meet with the CSU to discuss further space allocation on campus. Dean Pruden, director of Instructional and Information Technology Services Andrew McAusland, executive director of facilities management Peter Bolla, and special advisor to Concorida President Claude Lajeunesse John Parisella, held the first series of meetings with CSU President Khaleed Juma and VP services Angelica Novoa yesterday morning to address these issues. Juma said that although the school is talking with the CSU, they are committed to moving student activities to the seventh floor. The floor was renovated last year to accommodate new CSU offices. “It was made clear today [in the meeting] that they [the admin] are not really looking for consensus, but they are willing to consult,” said Juma. 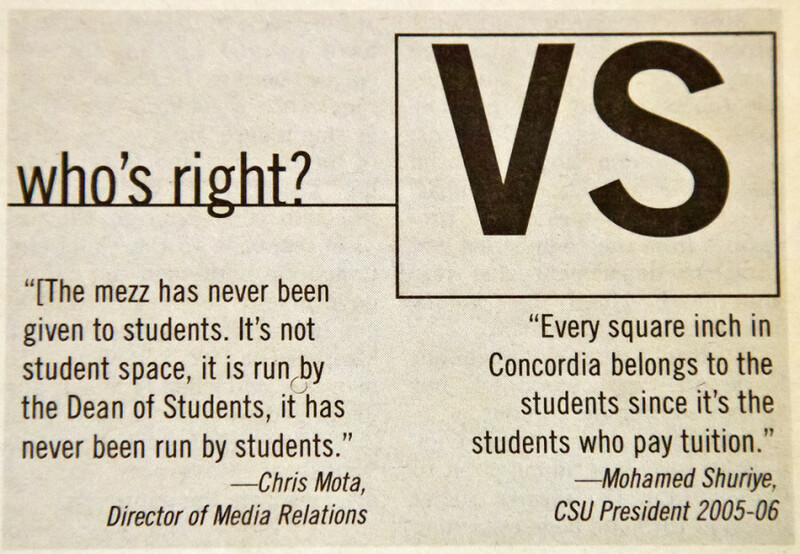 While the mezz is important to them, CSU executives say they are willing to compromise. “The ultimate victory of the CSU [would be to have] continuing access to the mezz. However, the CSU would concede a partial victory in signing a comprehensive space agreement for the rest of space on campus,” Juma said. Chris Mota, the director of media relations for the university, spoke on behalf of the school and said she has “no way of answering” why it took a public demonstration for the school to sit down with the student union. Mota said that the initial plans for the lounge space on the mezzanine were laid out two years ago and were part of a larger plan that included the seventh floor lounge and the proposed new student centre. She said that the CSU and then-president Brent Farrington were consulted about the proposed changes. Farrington, who is now on the national executive of the Canadian Federration of Students, disagrees. He said that he was aware that the seventh floor could act as a space for clubs, but saw it as an extension of the mezz, and at no time did he or the rest of the CSU agree to give up the space. “[The seventh floor] was never meant as a replacement for the mezzanine, maybe in [the administration’s] eyes, but they certainly hid that fact from the students,” Farrington said. Concordia Board of Governors representative and last year’s CSU president Mohamed Shuriye could “very well not be aware” of the proposed changes as she acknowledged that information is not always passed on from year to year due to regular CSU executive turnover. She added that the CSU was informed as soon as the university’s furniture order was ready. “They knew when we knew,” Mota said. Shuriye said the CSU should have been made aware that the admin was getting furniture ready to be moved on the second floor. “We want guaranteed, dedicated and autonomous student space on campus,” Juma said. And according to Mota, the mezz does not fall into that category. “[The mezz] has never been given to students,” she said, “It’s not a student space, it is run by the dean of students, it has never been run by students,” she said. Shuriye disagrees. “Every square inch in Concordia belongs to the students since it’s the students who pay tuition,” he said. For the time being, Juma and CSU executives will try and get the word to the Concordia community about the events taking place. He continues to believe that the admin is working “in good faith” when it comes to the further negotiations for space but said the recent news “irks” him and his executive. “It’s hard to continue on that path [of good faith negotiations] if we’ve been told that they [the admin] are going ahead no matter what,” he said. The next meeting between the CSU and the admin over the allocation of space takes place this morning at 10:30.